Baroillet presented the Ministry of War with an instrument containing moving parts which he called a Kinographe, accompanied by an explanatory Mémoire. Corrected in the scribe’s hand in many places, this manuscript may be the first draft of the Mémoire. After a short exposition of various methods of encryption, Baroillet proposed a method of date-dependent encryption using the Kinographe for messages sent via semaphore towers . The Committee on Fortifications approved of Baroillet’s Kinographe, but offered no precise description of the Kinographe device which, naturally, had to be kept secret. 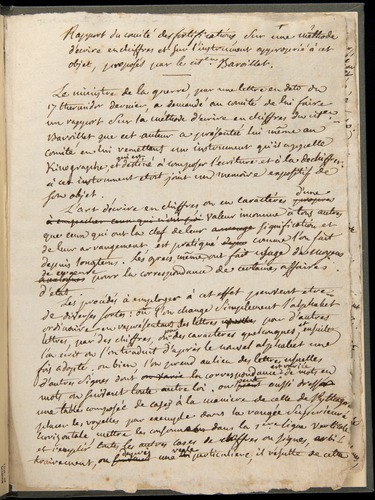 Cryptographic material from the French Revolution is very rare, although cryptology played an important role in the diplomatic and military history of the period. This entry was posted in History of Science and tagged Cryptography. Bookmark the permalink.